The Steerable Grasper is the first multi-steerable instrument of our advanced laparoscopic surgery line. 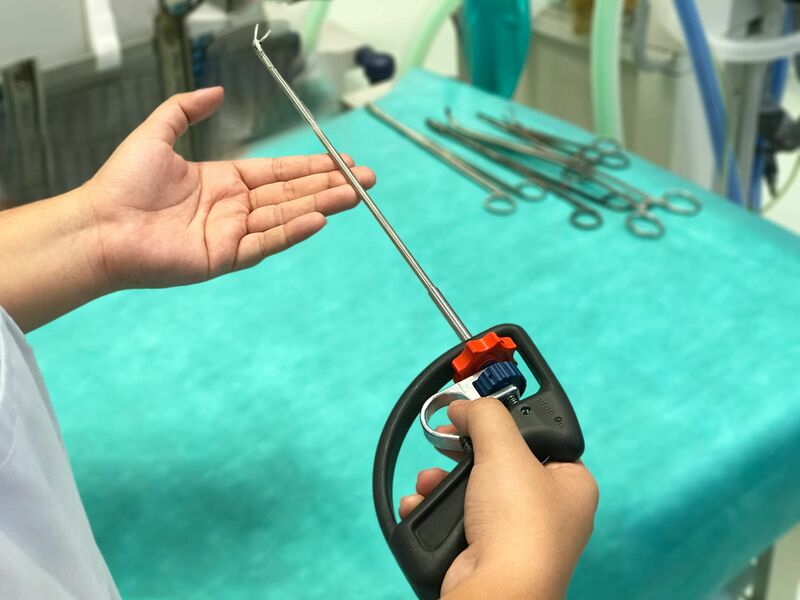 Based on our patented steerable mechanism, the Steerable Grasper features freedom wrist function of two degrees in the tip that allows surgeons to perform advanced laparoscopic procedures in an intuitive and ergonomic way. The modular instrument’s tip can steer on 2 additional axis. This improves reachability and allows a superior alignment with critical structures without compromising the surgeon’s comfort. The Steerable Grasper can be easily assembled and disassembled. It has 70% fewer parts than current steerable instruments, making it easy to clean with low-tech sterilization means. The handle interface of the Steerable Grasper is operated by two wheels that are aligned with the shaft for intuitive tip steering. 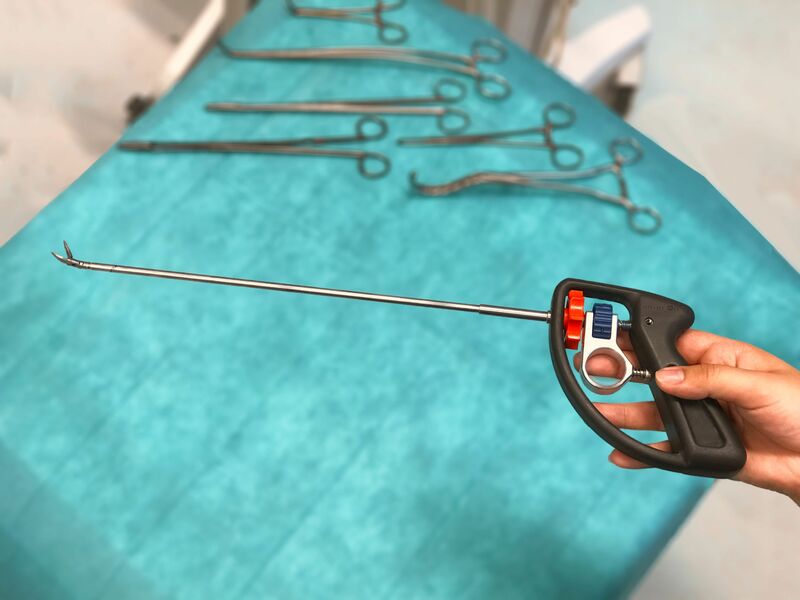 Based on the Shaft Actuated Tip Articulation (SATA) technology, Surge-on Medical created a new line of steerable, configurable, and reusable instruments for laparoscopic use. 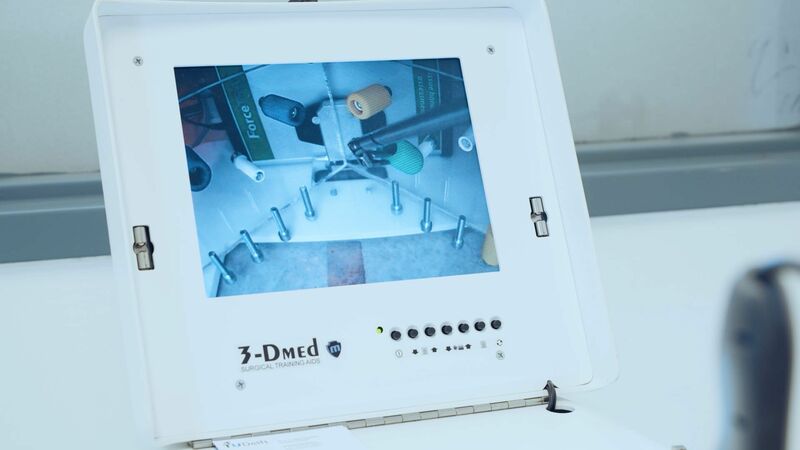 The new instruments operate without cables and provide an intuitive and elegant solution that meets the needs of the surgeons, staff, and sterilization department. The Steerable Grasper is the first instrument in the line, available in the 5 to 8 mm range. Our innovative instrument designs are fully compliant with future regulations for endoscopic instruments as envisioned by the FDA. This gives us a competitive advantage over steerable instruments that are not detachable. Better surgical outcomes. Better instrument alignment capabilities and a smaller shaft allow the surgeon to manipulate tissues more efficiently with lower force and smaller incisions. Faster surgeries and faster healing. The patients could recover faster and spend less time in the hospital. Ideal instrument to spread advanced laparoscopic surgery to all corners of the world. Laparoscopy is performed through small incisions of around 8 mm long in the abdominal wall, where long slender instruments are needed to manipulate, cut, and repair tissues. 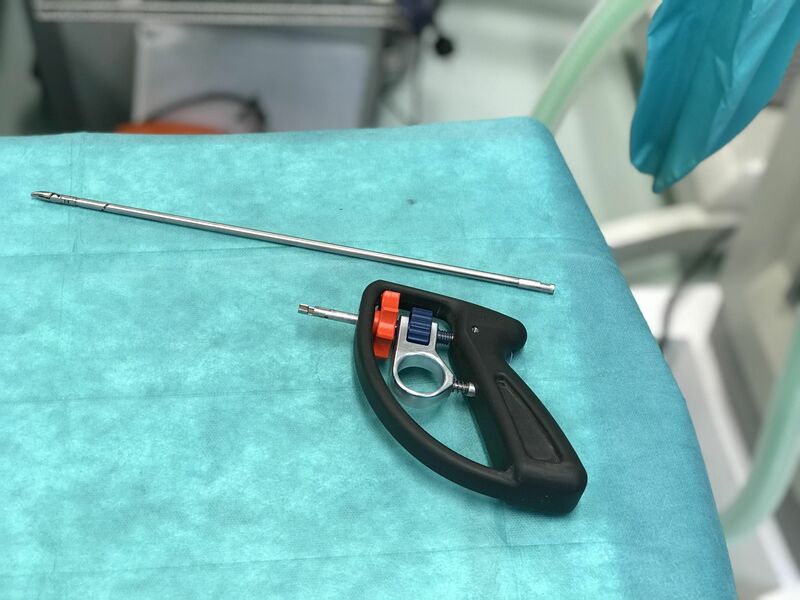 The current trend is to use steerable instruments for better reachability inside the abdomen, but most of the tools are cable driven, and have complex designs and bulky handles, ultimately limiting their use in advanced laparoscopic surgery. Complex mechanical steering mechanisms in instruments, which often use a combination of springs, cables, pulleys, and guiding structures that are difficult to clean. As a result, those instruments are disposable or have a very limited lifespan. High purchase and sterilization costs due to the complexity of instruments. Unergonomic handles and instrument interfaces that cause back and upper extremity discomfort in surgeons. Designs that do not meet the new FDA cleaning standards regarding future endoscopic instrumentation. Watch the Steerable Grasper being used for ability tests in the following video. Surge-on Medical will launch the Steerable Grasper on the market at the end of 2019. This technology led to the development of our portable surgical robot PoLaRS. The Steerable Grasper is the first instrument in our line of modular steerable instruments for advanced laparoscopic surgery. Our steerable technology can be adapted to multiple diameters and end-effectors such as scissors, atraumatic graspers, needle drivers, and clip appliers towards fulfilling the needs of our partners and customers. Additionally, Surge-on Medical is starting the development of a wide range of energy powered end effectors.